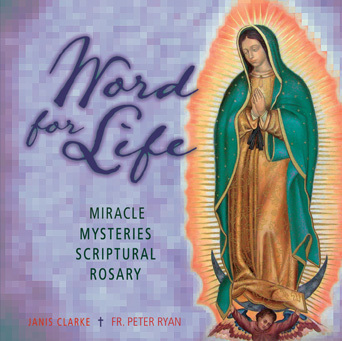 A dramatic narration of each mystery, interspersed throughout the decades with bible verses before each Hail Mary. Beautiful bible chants with four part harmony composed by Janis (after each decade) that correspond to each miracle mystery. Background music comprising compositions by Janis Clarke. Songs composed by Janis to help listeners enter more deeply into prayer and the presence of Christ. These include Pie Jesu (choral version), I Believe, StTtOP, Angels Around the Throne, Beautiful Jesus and Pie Jesu (solo version), as well as the popular Marian hymn, “Immaculate Mary”. An invitation to enter with Mary, into the miracle mysteries in the life of Jesus, and grow in faith as He invites his followers to do whatever he tells us, put out into the deep, step out on the sea, rise from the dead, and believe!